If you didn’t receive this via email, leave your name and email address in the Contact Us section and we’ll put you on our mailing list for future issues. Share this widely; we want to spread the word. If you have a suggestion for a new name for us, leave your ideas in the Contact Us section. https://medicalxpress.com/news/2017-08-reverse-aging-brain.html if you want to learn more. Here’s a NYT article with good information about aging well, including dancing. Here’s a link to an incredibly informative Reference Guide from the NC Insurance Commissioner’s office, comparing ALL the licensed CCRC’s in the entire state! To find an individual CCRC pdf page, add 9 to its map number. We recommend that you check the map on p. 9; look at and compare the ones in Durham, Chapel Hill, Raleigh, and perhaps Burlington and Greensboro, as well as Pennybyrn (#27, pdf p. 36), which uses the Household model. In addition, the fee ranges on the individual pages can give you a sense of current local pricing. When you click on the link it may automatically download the PDF to your computer, depending on your settings. Our plans include a vibrant, musical environment where all of us can continue to enjoy the activities we love for as long as possible. We are also thoughtfully planning for the period of life when we slow down so much we need a lot of assistance. If you’ve ever been dismayed by the institutional, impersonal feel of many ‘nursing homes’ you may think that a retirement community is a sad and depressing place. The “Household Model” is a relatively new approach that we plan to implement. This comes from the website of Action Pact, the development group we’ve contracted with to guide the design process. That process begins in January, 2018! TTMADRS is now able to accept donations of stock or mutual fund shares into a Schwab brokerage account. In some situations, there are tax advantages for donating appreciated shares instead of cash. 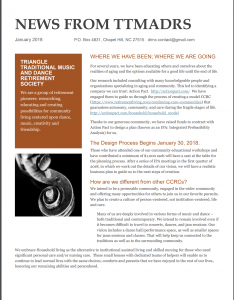 Basically a person who wants to donate stock contacts Schwab (or their broker does), gives our name (“Triangle Traditional Music and Dance Retirement Society” in full) and what they want to donate. Please Contact Us with any questions you have about this process. Both this book and DVD reflect the philosophy and motivation of the Traditional Music and Dance Retirement Society and our pioneering vision of how we want to live in old age. Many of us have seen a clip from ALIVE INSIDE; now the entire film is available to purchase or to stream from Netflix or I-tunes. Being Mortal, by Atul Gawande, is groundbreaking and brilliant. Many of you have already read it. If not, this might pique your interest. Here’s a summary from a NYT review and a link to the full review. This should be easy to find at your local book store.